Hyprocure Surgery on both feet now completed leading to stability. This is my first update blog following the 2nd HyProCure Surgery now done on my right foot. No more Subtalar Joint Recurrent Dislocation of my Talus over Navicular and Calcaneus bones of my right foot. Eliminated excessive or hyper-pronation of my foot. See my last blog regarding the surgery. On 2-12-14 – Dr. Gent removed the bulky wrap and splinting he had applied in surgery 5 days earlier on 2-7-14. He re-wrapped my foot with some gauze over surgical incision, some Webril-type undercast padding, a new formed posterior splint for support all underneath ace wraps and I could begin to bear weight now on my foot as tolerated. 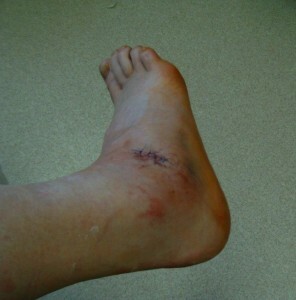 Here is a photo of my foot before it was re-wrapped. (Click on photo to enlarge.) 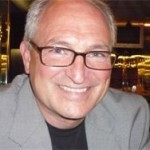 Here is Dr. Gent’s video discussion with me and a link to his office at www.kitsapfootandankle.com. I left Dr. Gent’s office with a little too much hope too soon. By the time I had walked more on my foot still with the aid of crutches out to the car, I realized immediately that I was not as well off as I so hoped this soon after surgery. I had wanted to go back in his office as I was having mental torment over the sharp pain I was feeling in my ankle joint where the distal fibula meets the talus and not the subtalar joint where the surgery was performed. All I could think for the moment is that something is not right. This foot did not compare at all to how my left foot had felt at its 5-day post op appt. I thought for sure I’d be better off with this right foot sooner since it did not have as bad all the prior chronic problems like my left foot had before its surgery. (See the beginning of my Subtalar Joint Instability Blogs). I had even been more cautious up until this point with less weight bearing compared to the prior time and I had less post op pain and less medication needed; yet, what was going on now as I tried to walk? It surely didn’t get any better the rest of that night until I cried myself to sleep with my Breg-Kodiak Polar Care ice therapy going all night over my foot. 2-13-14 – I woke up feeling very good in my foot and then as soon as I walked my first steps of the morning, I was upset all over again. I could only describe it as a feeling of a joint out of place/mal-alignment bone pressure/severe ankle sprain or who knows what. I had pain that radiated up to and around my right lateral knee- proximal tibiofibular joint. My experience has taught me that a joint instability can feel great after a night’s rest but the pain comes immediately after walking on it. I needed to get packed to fly home while needing the crutches to stay completely off of my foot at this moment to avoid the sharp pain was not my idea of a good morning. I had no help as my friends were at work before coming back to get me to take me to the airport. After texting Dr. Gent, he was so kind to promptly return my call. He offered for me to come back to his office but how could I? He was an hour ferry boat ride away and I needed to leave for the airport. Dr. Gent offered his best phone advice for the moment. Re-wrap my ankle in a figure eight pattern for additional support to protect the ankle joint/ligaments and treat it as though I had a high ankle sprain and stay non-weight bearing while taking anti-inflammatory medication. I shared with him my strong suspicion/opinion that my fibular bone was out of alignment against the now neutral and correct alignment of my Talus otherwise why would I also have pain around my proximal fibular head too. I shared with him that I desperately wanted to see my chiropractor the next day when I got back to Lewiston. I assured Dr. Gent that my chiropractor would only touch and adjust if needed my proximal tibiofibular joint and do nothing to adversely affect my post surgical ankle/foot. Dr. Gent wanted to hear from me again in a few days after being back home. I took 3 Alleve (I need a higher dose to be supposedly be effective) while waiting for my plane after I was able to get some food in my stomach first. When I arrived back at my Lewiston, ID home after a perfect day of flying out of Seattle, I proceeded to get my DonJoy Maxtrax Air Walker Boot and put it on over my fully ace wrapped lower right leg. This helped support my leg and ankle and take the feeling away of sharp pain as the Alleve thus far had not helped at all. The figure eight ace wraps were not enough support either. Again I went to bed and woke up feeling better in my leg until trying to walk again the next morning. I left my chiropractor’s office feeling like this medical journey was not over in the least bit. My right Proximal Tibiofibular Joint was not holding. I knew this was a concurrent problem going into the HyProCure Surgery as I had tremendous apprehension/anxiety at the question, “What if this does not do enough for my right lower extremity to stabilize it?” However, I knew I had to start somewhere by settling the foot/subtalar joint issue first as it was the less invasive/ less expensive surgery as compared to the Proximal Tibiofibular Surgery that I had done on my left leg last year. I liked the stability the HyProCure surgery had given me on my left foot/subtalar joint and simply needed the same thing for my right foot. But what about this Proximal Tib-Fib issue– the chronic posterior subluxation of my fibula bone just like the condition I had on my left leg? Please see www.fibularpain.com for the entire journey in diagnosing my left leg Proximal Tib-Fib issue and its successful surgical outcome. Now, what do I have to do since this pain up my right leg really does not correlate to the HyProCure Surgery? Yes, the bio-mechanics ultimately change for the better with the HyProCure for your entire leg, but how do I handle this sharp pain that was not manifesting before my surgery? This was quite a shock and an unexpected surprise. I thought by fixing my foot first that maybe my fibula dysfunction would somehow settle down too. I was very scared and I felt so bad having to tell Dr. Gent that I was more miserable now even though I knew beyond a shadow of a doubt that this had nothing to do with his surgical intervention to correct my partial dislocation of my Talotarsal complex. I appreciated Dr. Gent’s kind support to help me through this post-op situation. Stay tuned for my continued updates on the healing of my right foot from the HyProCure Surgery and where the journey leads to regarding my right Proximal Tib-Fib issue and its relationship to my now neutral Talus/Calaneus bones along with an arch that does not have a dropping Navicular bone any longer. To see my concurrent Spiritual Journey Blog related to this medical blog please click here. To avoid wondering when I post again, please just subscribe to this blog (right sidebar) to receive automatic updates whenever I post a blog story about my medical and spiritual journey.